Hello. Can't believe it is Thursday already. These are the tags I took to my Christmas party at my LSS to exchange. We had a nice dinner and gift exchange and then we exchanged gift tags. I got some cute tags from the other gals too. Had Michael on my couch all day today with a stomach thing. He slept for a couple of hours this afternoon, so hopefully it was a 24 hour thing and he will feel better tomorrow. It is donut Thursday, and when he didn't want a donut, I knew he was sick!!! 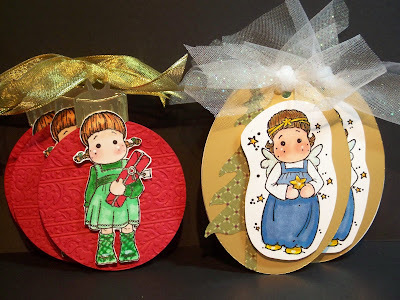 Sue, Wow I love these adorable Gift Tags, the new Christmas Maggies are so cute and would look beautifull hanging on the Christmas Tree as ornaments or on a gift. They are wonderfull coloured & I love the tulle and glittery ribbon, just beautiful. Such a great idea for swapping. Hoping Michael is feeling better soon. These are gorgeous Sue - I bet they were in hot demand at your swap! All the best for the sickie too - hope he manages a donut soon! Awwww, these are sweet, love the cutout trees and the ribbon and the tilda's, and well, all of it!! I bet you could place the tags from the swap on a little mini tree to display them, that would be really neat!! I hope you had fun. Send me Michaels donut, lol!! Hope he is feeling better soon!! Cute tags Sue - so sweet. I hope Michael is better and making up for the missed donut! You're gift cards turned out terrific!